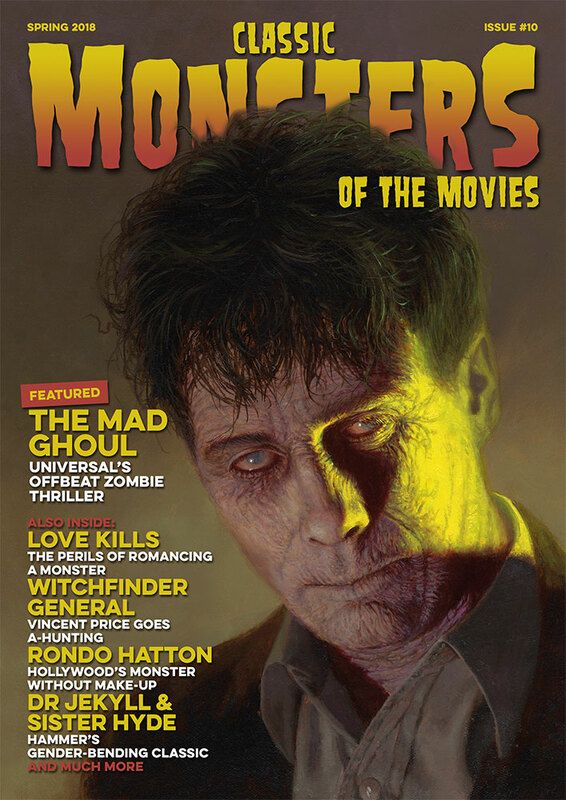 Classic Monsters of the Movies issue 10 is packed with more of your favourite classic horror movies and stars, presented in the timeless style that you won’t find anywhere else. Full colour throughout, it’s filled with informative and insightful articles – the perfect antidote to all your nostalgic cravings for the monsters of yesteryear. This issue features beautiful new cover art from Daniel Horne – the perfect introduction to our feature-length article on 1943’s The Mad Ghoul. We think this horror gem doesn’t get the recognition it deserves, especially considering its cast includes the like of horror favourites George Zucco and Evelyn Ankers, and in this issue you’ll find out what makes it so special. Naturally, that’s just the beginning, with a range of other articles bringing you a fresh take on the world of classic horror. 1968’s thrilling Witchfinder General goes through its trials… rarely has Vincent Price been this scary. Hammer fans have a treat in store too, with an exploration of slick 1971 classic Dr Jekyll and Sister Hyde. Other articles include a look at the messy romantic entanglements of our various monsters and their associates – who knew it would be so difficult for a monster to find happiness? There’s also a biography of Rondo Hatton, and so much more besides, making this an issue you won’t want to miss. The Mad Ghoul – enjoy a new angle on the undead with our in-depth exploration of Universal’s 1943 cult classic. David Bruce is an altogether different kind of zombie in this tense, skin-crawling movie that boasts plenty of great twists. Love Kills – being a monster isn’t easy, especially when you’re looking for love… From the Frankenstein Monster’s failed attempts to find a soul mate, to the lusty vampires of Hammer Horror, the horror genre is packed with broken hearts. We look at the love lives of our favourite heartsick beasties. Witchfinder General – aggressive, raw and brutal, this depiction of life in the English Civil War pulls no punches at all. Vincent Price is on perfectly malicious form as Matthew Hopkins, but there are plenty of other reasons to rewatch this powerful piece of cinema too. Rondo Hatton – stricken with the medical condition acromegaly, Rondo Hatton became a tragic figure in horror cinema as well as an icon of the genre. We look at some of his most powerful performances and examine his place in horror lore. Dr Jekyll and Sister Hyde – with Ralph Bates, Martine Beswick, Dr Jekyll and Jack the Ripper all together in one movie, it’s no wonder this is a classic of the Hammer Horror era. 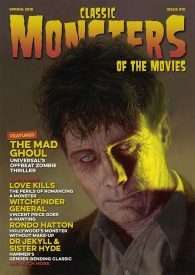 Issue 10 of Classic Monsters of the Movies is bursting at the seams with the kind of horror movie nostalgia you used to love as a monster kid of the 60s or 70s. With stunning articles and features from the leading lights in the world of horror magazine publishing, it allows our love of yesteryear’s horror film treasures to shine bright. You’ll soon discover why CMotM is fast becoming the world’s favourite monster movie magazine. excellent item, highly recommended, outstanding! This mag keeps getting better and better. EXCELLENT ! 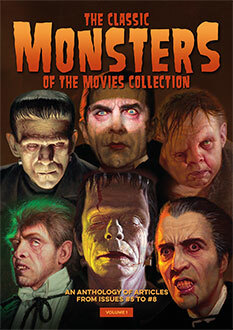 and secondly for helping me re-visit my youth as a former fan of Famous Monsters of Filmland and the Aurora model kits. Memories that were all but forgotten.